Maui Jim is passionate about creating the best sunglasses on the planet. We want to see one of our fans rocking a pair this summer! Be sure to enter to win a pair below. Good luck everyone! Enter to win via the Rafflecopter entry form below. Giveaway ends July 18, 2013 at 11:59 pm EST. Giveaway is open to the Continental US. My husband would get these if I won. They really look great. Thanks so much. I would keep them for myself because I have always wanted a pair of maui jims! I would give these to my husband because he is always losing his sunglasses. My boyfriend! They would look great on him! I would give these to my son, they would look fantastic on him! He only buys high end sunglasses and would be ecstatic to own a pair of these high-quality Maui Jim sunglasses. I would have to keep these for myself! I have never had a nice pair of sunglasses and especially not a pair this expensive. Hate to be selfish, but I am being honest. i need some new shades my dog eat mine a few days ago. my husband would get these. Not only does he deserve something nice but I have always wanted to be able to give him a pair of nice glasses. If I won I would give these to my stepdad because he spends a considerable amount of time outside in both his job and personal time. You rock! I do want these, but now I think you should win just for creativity! I would send these to my middle son Kasey in Oklahoma .. these glasses look great & he would love them .. These would be for me. I need a quality pair of sunglasses and have wanted a pair of Maui Jim for a while. I would give them to my husband. He loves Maui Jim! I am SOOO keeping these for me! I would definitely give these to my brother! I would give these to my husband, because I think he would look good in them. My old glasses just cracked, i could use a new pair. I would give these to my husband! I know he’d love them. I would give these to my husband! I will give them to my son. He is in the Air Force and currently stationed in Aviano, Italy. I know he would love them. Me. I already own two pair of MJs. Might start a collection bug! I’ve been looking for a pair of nice sunglasses for a while now. These look extremely nice. If won, they would be for myself. These look so slick… I would keep them all to myself. I would give these to my husband, he could really use some sunglasses! I would give them to my father for raising all 3 of us kids the right way. These will be for me because I’m currently wearing Dollar Tree sunglasses. Let’s upgrade! I would keep these as my sunglasses have a lot of scratches. Are they good for playing sports? They do actually make several pairs for playing sports. You can check them out here http://www.mauijim.com and when you click on shopping by men or women you can shop by activity which is nice. Sunglasses give me a headache too! I think it’s because some of them fit too snug or maybe I just have a large head. lol I do have a pair of Oakley’s that I like pretty good but they are too snug. my friend bought a pair of Maui Jim sunglasses probably 10 years ago. I told him he was crazy for what he spent. He still wears them to this day and they still look great. I would love a quality pair of sunglasses like this. I used to think it was crazy too but we wear Oakley’s and they really last a long time. 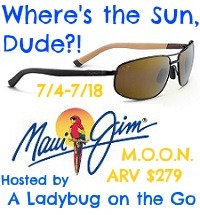 I’d love to try a pair of Maui Jim sunglasses too! I would keep these for myself. I have been needing a pair of quality sunglasses. I would keep these in my car, so whoever is driving it could wear them. These are for me – I am a great Mom and watch my grandson full-time – so this will be a little bonus present for me 🙂 Thanks for the chance! My teens first pair of really good sunglasses. This time of year he is out getting reday for band to support their great football team. I would keep them in the car for whoever is driving- we get glaring sun and blind spots twice a day here (sunup and sundown) so these would really be nice to have in case we don’t have our “regular” ones when out and about. I would give these to my husband…he could use a new pair of sunglasses! i would love to win these for my husband, he needs some stylish sunglasses! All me, baby! I haven’t had a pair worth over $30 in quite a while. Time for some pampering! If I win these I would send them to my son who is a police officer and can always use a good pair of sunglasses. I would have to keep these for myself! It’s been a long time since I’ve had a pair of sunglasses that fit me properly and I liked. I would keep them for me. My grown son would get these. He needs a pair and his birthday is coming up. I would keep these for myself as I need a pair of sunglasses. It’s a toss-up as to who would get them – “him” or me??? I would keep them and always need a pair on the boat! My husband has a nice sunglasses collection going and he would love these. For me because my eyes are sensitive to the sun. I’d love to win these for my husband.